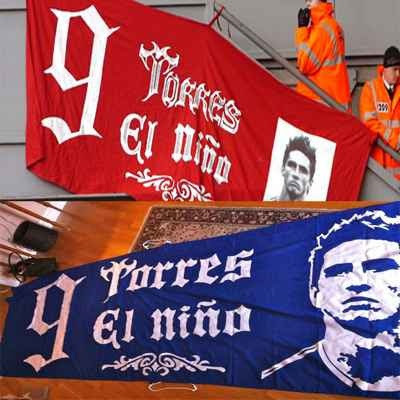 Yes, supporter groups copy each other, so it isn't surprising to see Chelsea supporters displaying a banner reminiscent of a Liverpool banner at Sunday's Chelsea-Liverpool match at Stamford Bridge. After all, Fernando Torres was in a Liverpool kit just last week and now he's in Chelsea blue facing his old team from the north. But to leave the Shankly Gates in the banner too . . . tsk tsk Chelsea fans. Love it! Thanks for posting this – just googled for a picture of it having laughed my head off at the match yesterday. Thanks for the comment & viewing the site. Much appreciated.